Examples of topics include: the basic characteristics of investment products; the relationship between bond price and yield; rights of common stockholders; regulatory entities; the role of broker-dealers, investment advisers, issuers, and underwriters; the primary, secondary, third and fourth markets; definition and identification of investment risks; investment returns, orders and strategies; customer account types, characteristics, and registrations; prohibited activities; and SEC, FINRA, and MSRB rules and regulations. College students can prepare for the SIE exam while still in college if they are interested (or MAY be interested) in a career in the financial services industry upon graduation. Since candidates do not need to be hired by a FINRA member (broker-dealer) first to take the SIE, it is beneficial for college students to pass the SIE exam prior to graduation as an expedited pathway to getting a job with a brokerage firm down the road. Passing the SIE exam makes a college graduate more marketable in the field since it eliminates one step that other job candidates will have to complete. Broker-dealers will save money (and time-which translates to money) by hiring candidates who are ready to join the firm and begin studying for the top-off Series 6 or Series 7 exams, which are required to sell most securities sold through these firms. Upon successfully passing the SIE, students will have an advantage in their job search, helping them stand out to potential employers. Exam results will be valid for 4 years without being sponsored by a FINRA member, allowing students enough time to complete the requirements to become a registered financial services professional. Preparing and taking the SIE before being hired by a firm takes the pressure off passing the exam and reduces test anxiety. If a candidate does not successfully pass the exam the first or second time, they must wait 30 days after each attempt before retaking the exam. Taking the exam in a “no-pressure” situation will improve the student’s chance of passing it the first time. The SIE curriculum can be incorporated into existing economics, insurance, or finance courses. This provides a career opportunity for undergraduate students majoring in business or finance. 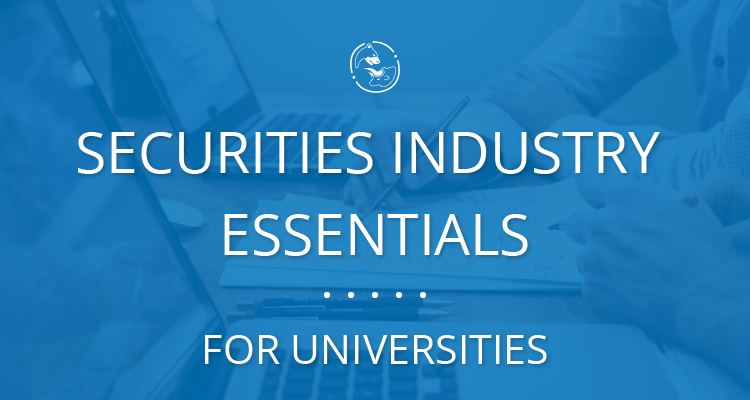 Offering the SIE allows colleges and universities to initiate, build, and foster partnerships with financial services companies. This relationship can lead to mentoring, internships, and ultimately job placement. By completing this step as a college student, job placement through the college will increase. Higher job placement statistics make the college more appealing to incoming students, therefore, increasing student enrollment. The A.D. Banker course is highly interactive and includes online exams, electronic flashcards, streamed videos, and activities designed to engage students along the way and prepare them to pass the SIE exam and preparing them to enter the financial services industry job market. This course was written by industry professionals who have years of experience in the real-world and the education and testing environment. We will provide training materials for the faculty, including a comprehensive study manual, a PowerPoint presentation, access to the online course, and live web classes.